This probably won't come as much of a surprise, but analyses of the average global temperatures in 2005 released by four scientific agencies - The National Oceanic & Atmospheric Administration (NOAA); NASA Goddard Institute for Space Studies; The World Meteorological Organization; and the UK's Hadley Centre for Climate Prediction and Research - all agree that 2005 was either the hottest or second-hottest year since the start of record-keeping in the late 1880s, according to a post from Green Car Congress yesterday. 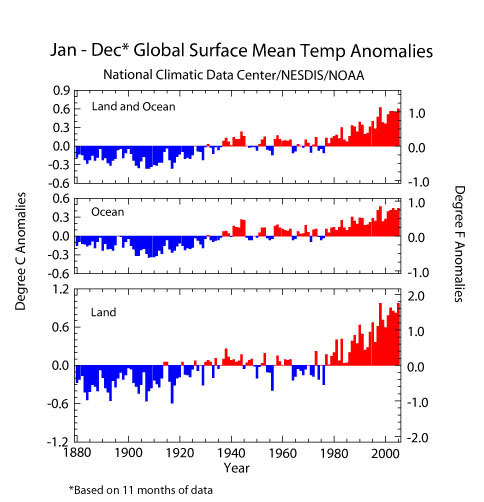 The 10 hottest years on record have all occurred since 1990 (see accompanying graphic). The assessments vary by a few hundredths of a degree. 2005 is particularly interesting becuase Unlike 1998 - the previous winner of the 'hottest year on record' honors - 2005 had no strong El Niño to warm ocean waters, which affects temperatures worldwide. While average temperatures are warmer across the globe, the largest temperature anomalies were found throughout high latitude regions of the Northern Hemisphere and included much of Russia, Scandinavia, Canada and Alaska. During the past century, global surface temperatures have increased at a rate near 1.1º F/Century (0.6º C/Century), but the rate of temperature increase has been three times larger since 1976, with some of the largest temperature increases occurring in the high latitudes. The diversity of these anomalies serves to illustrate how the popular moniker 'Global Warming' is both a little misleading - some regions may end up cooler rather than warmer - as well as a poor descriptor for the diversity of events and effects that result from higher average temperatures. This is why 'Global Climate Change' ought to be the appropriate term for such phenomena and I am dissapointed to see the term 'Global Warming' used even in scientific articles. Green Car Congress has more on the results of each of the four studies and Real Climate has a discussion of the 2005 temps here. The Energy Bulletin reports that Swedish Prime Minister, Göran Persson, has founded a non-political committee with the intent of making the Scandanavian country fossil fuel-independent by the year 2020. The members of the committee include Professor Christian Azar of Chalmers University of Technology, Leif Johansson, CEO of Volvo Group, makers of trucks, buses and heavy machinery, Birgitta Johansson Hedberg, CEO of the Swedish Farmers Supply and Crop Marketing Association and Christer Segersten, chairman of the Södra member-owned forestry group as well as representatives for the energy sector and industry. The committee is charged with the task of studying and proposing measures and mitigation to reduce and then eliminate Sweden's use of fossil fuels. They will take the next six months to do their research and construct their recommendations and will present their findings and suggestions this summer. An initial hearing in front of an assembled audience of journalists and other interested people held December 13th began with a speech from the Prime Minister. He cited concerns that Sweden is about to experience Peak Oil and therefore needs to assess measures to mitigate its effects and to transform society to adapt to it, including addressing how transportation and car use will look in the future. PM Persson underscored that Sweden is very fortunate to have vast agricultural and forestry resources, and to have excellent access to fresh water and no need for irrigation. The Prime Minister's speech was followed by a short lecture introducing peak oil, by Association for the Study of Peak Oil (Sweden) chairman Kjell Aleklett which was in turn followed by the CEO of the Swedish Petroleum Association and professor Sven Kullander of the Royal Swedish Academy of Sciences. After lunch there were lectures on climate change by professor Christian Azar and Gunn Persson of Swedish Meteorological and Hydrological Institute, and statements from committee members, including Volvo CEO Leif Johansson. Volvo has conducted research into future fuels for commercial vehicles and mentioned peak oil before, and is converting one of it's factories to 100% renewable energy. Sweden currently gets almost all of it's electricity from nuclear and hydroelectric power, and mostly relies on fossil fuels for transport; most of the heating has been converted to electric space heating, biofuels and waste recycling, while a small percentage remains fossil fueled. A 1980 referendum decided to phase out nuclear power as well, although the Energy Bulletin reports that this has been severely delayed so far, with the exception of the mothballing of the Barsebäck 1 and 2 reactors. 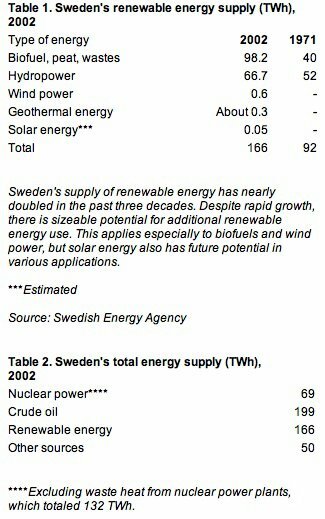 As you can see, broadly speaking, Sweden’s energy mix consists of somewhat more than 40 percent oil, nearly as much renewable energy and 20 percent nuclear power. Energy Bulletin reports that there has been a recent trend in Sweden towards increased sales of flexfuel E85 (ethanol) vehicles and fuel, and there are projects underway to increase domestic production of ethanol and synthetic fuels from forest industry waste. The commissions recommendations will almost surely involve an increased use of biofuels. "Since the international oil crises of the 1970s, the aim of Swedish energy and environmental policy has been to boost the share of renewable energy in the total mix. This has mainly been true of bioenergy, but also efforts to harness wind power and solar energy. The use of biofuels has risen sharply in the past 25 years, from 50 to nearly 100 terawatt hours (TWh). A large proportion of this increase is explained by the fact that more than 50 percent of district heating supply is based on biofuels. In the past 25 years, the Swedish manufacturing sector has replaced much of its oil consumption with electricity and biofuels." 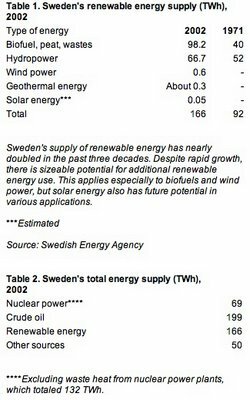 Sweden obviously still has a long way to go however, especially if they still plan to phase out nuclear power as well. 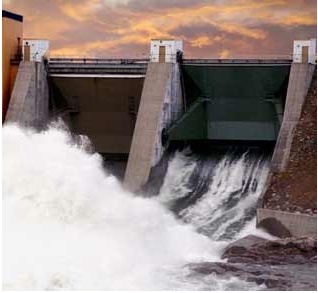 The country is blessed with large renewable resources however including already highly developed hydro resources as well as significantly underdeveloped wind resources. They will also likely turn to an even greater utilization of their rich biomass resources. Iceland has also proposed to move towards a fossil-fuel independent future but has set the less ambitious date of 2050. I must give props to both nations for their efforts to move towards an entirely renewable future. While Sweden and Iceland do have significant renewable resources, it must be noted that they do not necessarily have any more than many other nations, the United States and Canada included. If you're curious about what kind of renewable resources the U.S. has available and has yet to tap, check here for solar, wind and geothermal with a combined interactive map here. We certainly have the available resources to follow Sweden's lead and move towards a sustainable and renewable energy future. Do we have the willpower? CHICAGO—With winter's onset driving the demand for surface coal to record-high levels, the mineral's cost is now beyond the reach of low- and middle-income Americans who wish to punish their naughty children. "Coal in one's stocking is meant to serve as an admonishment or warning, not as a dependable grade-B investment," said William Menchell, a commodities adviser for T. Rowe Price. "In today's market, children should only have their stockings stuffed with lumps of coal if they have been studious and obedient, and show an interest in long-term investments in the energy sector." For more affordable punitive options, analysts point to the relatively stagnant switch market, which could soon go the way of coal if demand increases for combustible wooden sticks. The House of Representatives voted early Monday morning to approve the Budget Reconciliation Bill (which no longer had ANWR language attached) as well as the Defense Appropriations Bill (which did have ANWR language attached, see last ANWR update). However, opposition in the Senate led by Senators Maria Cantwell (D-WA), Harry Reid (D-NV), Joseph Lieberman (D-CT) and John Kerry (D-MA), prevented a vote today on the defense bill which contained a rider ammendment that would have opened ANWR for oil exploration and extraction. In an after-midnight vote ending a marathon session of negotiations and bargaining, the House approved the deficit reduction bill by a thin margin of 212-206. It now goes to the Senate (again) where it is expected to face an even tougher vote. The deficit reduction bill passed by the House claimed savings of $39.7 billion over five years, 2.5 percent of the $1.6 trillion in total red ink that congressional officials estimate will pile up for the same period. The budget bill was formerly the focal point of the ANWR debate after a rider amendment was attached to the bill by pro-drilling members of Congress towards the end of October. The bill passed the Senate in November with ANWR language attached only to have the language dropped by the Republican leadership after it faced strong opposition in the House, including opposition from a number of moderate conservatives, which led House Republicans to fear that the ANWR language threatened passage the crucial budget bill. Pro-drilling advocates, led by Alaskan Senator Ted Stevens (R-AK), didn't let this defeat phase them and quickly proceeded to draft another rider that would open ANWR for drilling, attaching it this time to the defense spending bill. The defense bill, with the ANWR language attached, passed the House by a lopsided vote of 308-106 early Monday morning. Democrats were split as they were confronted with a choice of opposing the defense bill which not only contained money for the troops in Iraq but also Katrina relief appropriations and low-income energy assistance or instead voting for ANWR drilling. The defense bill then moved to the Senate where Democrats threatened to filibuster the bill over the oil drilling issue. Earlier today, Republican leaders fell four votes short of getting the required 60 votes to close debate on the bill and avoid the threatened filibuster. The 56-44 vote prompted GOP leaders to huddle in private over their next move. In a bit of Senate procedural maneuvering, Senate Majority Leader Bill Frist cast his vote with ANWR opponents which apparently allows him to resurrect the issue for another try later. However, Democrats said they expected the defense bill to be withdrawn and reworked without the Arctic refuge provision. Thus, 43 senators truly opposed refuge drilling including all but four Democrats as well as GOP Senators Mike DeWine of Ohio and Lincoln Chafee of Rhode Island. They are reportedly "intent and unyielding" and do not expected to budge should Frist try for another vote, according to Senator Lieberman. "It took a lot of guts for a lot of people to stand up," Lieberman, said after the vote. It seems that Senators were buoyed by hopes that a filibuster would succeed and were able to stand up to oppose the defense bill, unlike their compatriots in the House who lack the option to filibuster. Still, it takes a lot of guts to oppose ANWR drilling when it is hidden within a critical defense bill that also contains disaster relief money. I hope that those who stood up today to oppose ANWR drilling are not inaccurately branded as against Katrina relief or supporting our troops for taking a stand on this issue. As Senator Kerry, a strong critic of disturbing the refuge in northeastern Alaska by oil development, said today, "We all agree we want money for our troops. ... This is not about the troops." "Our military is being held hostage by this issue, Arctic drilling," fumed Sen. Harry Reid, the Democratic leader. The Nevada Democrat pointed out that the Senate could move quickly to pass the defense bill with Democratic support once the refuge issue was resolved. "This is nothing more than a sweetheart deal for Alaska and the oil companies," Sen. Cantwell had said. She had previously vowed that she was "prepared to use every procedural option available to [her] as a senator to prevent this language from moving forward." It seems that her tough stance has prevailed. Widespread public opposition to this latest attempt to drill in ANWR was quickly mobilized by groups like the Wilderness Society, SaveOurEnvironment.org, and MoveOn which likely contributed to this victory for drilling opponents. "There are literally hundreds of thousands of Americans following this issue," William Meadows, president of the Wilderness Society, said Tuesday (as quoted by the Post), adding that there has been "an outpouring of angst and concern" over Stevens' attempt to link hurricane relief money, low-income energy assistance funds and money for the Iraq war to push the drilling measure through a reluctant Senate. Todays vote was a stinging defeat for Sen. Ted Stevens, one of the Senate's most powerful members, who has been the most vocal and adamant supporter of opening the refuge for drilling. Stevens has tried everything he can to get ANWR language passed and it is likely that he and his supporters have not given up yet. Still, we can again be thankful for a temporary victory over drilling opponents and know that the pristine Arctic National Wildlife Refuge is safe, at least for the time being. The Wilderness Society and SaveOurEnvironment.org have brought to my attention another scheme from pro-drilling factions in the Senate to open the Alaskan National Wildlife Refuge (ANWR) to oil exploration and extraction. It seems that Senate Energy and Natural Resources Chairman Pete Domenici (Republican-New Mexico) said Wednesday that drilling language would finally be dropped from the budget reconciliation bill pending before US Congress. However, this is only a temporary victory as drilling proponents, led by Senator Ted Stevens (R-Alaska), are planning to shift their efforts to the Defense Appropriations Bill instead. They intend to add ANWR language to the must-pass Defense spending bill as a last-ditch attempt to open up ANWR before the Senate recesses for the holidays. According to Platts, House and Senate aides said that Sen Steven, Congress' most ardent supporter for opening up the refuge to drilling, is attempting to collect enough votes to override the almost certain Democratic filibuster of the Defense bill if ANWR language were included. They report that an unidentified Senate aide said yesterday that Stevens did not have the necessary 60 votes to override a filibuster, and reports today indicate that he only has 52 votes. Reuters reports that Senate Democrats said they will fight any effort by Republicans to use the crucial Defense Department budget bill to open ANWR to oil drilling. Most Democrats - excepting a few from oil-producing states - oppose drilling and have fought repeated efforts by drilling proponents to open ANWR. This latest attempt seems to be no exception. Reuters reports that Senate Democratic Leader Harry Reid said if the ANWR drilling language is in the defense spending legislation Democrats would argue it violates Senate rules because the provision is not related to defense issues. "The (Senate) parliamentarian will rule in our favor," Reid told reporters. Democrat John Kerry (D-Mass.) weighed in as well, saying, "It's appalling that the United States Senate is willing to hold our troops and hurricane victims hostage to their desperate attempts to satisfy big oil and drill in the Arctic Refuge." "Debate about the future of the Arctic Refuge is a debate about our failed energy policy and our environmental legacy, not about the funding of our men and women and uniform, and it would be grossly irresponsible to include the drilling provision in the final Defense Appropriations bill," said Democrat Russ Feingold. However, the defense spending measure is the only major legislation moving through Congress that ANWR could hitch a ride on, according to Senator Domenici, a major supporter of drilling in the refuge. 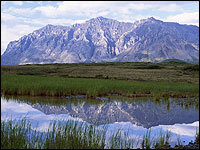 "It's clear (ANWR drilling is) not going in the budget ... If anything it's going in the appropriations bill on defense," Domenici is quoted in the Reuters article. According to Reuters, when Jeff Bingaman, the ranking Democrat on the Senate's energy panel, was asked if his fellow Democrats would filibuster such a move, he responded: "I would be surprised if some did not." Senator Stevens has been pusing the hardest to find some way to open up ANWR for drilling and it seems that he has ruled out no tricks to see it done. His state stands to get half the estimated $10 billion in bonus bids that energy companies might pay to drill in ANW, assuming oil prices were around $50 a barrel. The federal government would be the recipient of the other half of the revenue. The Anchorage Daily News reports that Stevens is also considering attaching ANWR language to the bill authorizing Katrina disaster relief money. ADN quotes Stevens as saying, "It's going to be awfully hard to vote against Katrina. ... And if it's in there, maybe disaster-area people will vote with me on ANWR." He did reportedly assure reporters that he would not withhold disaster relief in order to get the ANWR provision passed. Details aside, Stevens apparently is loath to give up on ANWR and ADN reports that he has pledged to stay in Washington until he passes an ANWR bill, even if that means keeping senators in Washington through the year-end holidays. I've made quite a bit of posts on the repeated efforts to open ANWR for drilling during this session of Congress. These efforts have repeatedly failed, although sometimes only by a thin margin. As I've said before, while the amount of oil in ANWR is not insubstantial, I find it very hard to accept the argument that drilling in ANWR has anything to do with domestic energy security when there are a whole host of much more effective measures - from increased fuel economy to promotion of plug-in hybrids and development of electric vehicles to efforts to cut-down on vehicle miles traveled and use domestically produced ethanol or biodiesel (from cellulosic biomass please!) - that get very little attention from Congress. If ANWR were simply one plank in a comprehensive effort to reduce our dependence on foreign oil, than I may be (reluctantly) willing to support it. At this stage, however, drilling in ANWR is about nothing more than ensuring additional profits for big oil companies (who are doing just fine if you ask me), and ensuring that Sen. Stevens can bring home some more bacon for his home state. I'll end with a bit of good news: the Wilderness Society reports that Congressional leaders announced this Tuesday "that they would drop mining provisions from budget reconciliation bill negotiations that would have put millions of acres of public lands -- including protected wildlands in parks, wildlife refuges, national monuments, and even wilderness areas -- up for sale." The provisions met broad opposition from all across the country from groups like hunters, anglers, businesses, governors, local officials, and everyday citizens. The measure would have altered century-old mining claims regulations that would allow the transfer of mining claims on public lands to private developers. TriMet, the public transit district serving the Portland, Oregon Metropolitan Area, announced this Tuesday that they would become the first transit district in the state to begin using biodiesel to fuel part of its bus fleet and one of only a handful of transit districts nationally that use the alternative fuel. TriMet will begin to test biodiesel in 75 of its LIFT fleet buses which provide door-to-door service for elderly and people with disabilities. The buses will be fueled by a B5 mix - a mix of five percent biodiesel and 95 percent petroleum diesel. "TriMet has been interested in using biodiesel for some time, and now that high quality biodiesel is available locally and the price of B5 is similar to regular diesel, we're able to move forward on this environmentally friendly fuel," said TriMet General Manager Fred Hansen. According to the press release, TriMet will receive 27,300 gallons each month of B5 from Carson Oil which will be deliverd to at the agency’s LIFT facility in NW Portland. LIFT vehicles are directly fueled from tanker trucks. Carson is an Oregon-based petroleum services company that serves Oregon and Southwest Washington. The company purchase the biodiesel from a supplier and blend it with petroleum diesel at its NW Portland facility. The press release reports that starting in January, Carson will purchase its biodiesel from SeQuential Biofuels, a Salem, OR-based biodiesel refiner and the first local biodiesel manufacturer in Oregon. The local biodiesel will consist of vegetable oil and used cooking oil from such places as NW restaurants and Kettle Foods, in Salem (makers of Kettle Chips). TriMet hopes that their use of biodiesel will play a small part in reducing their reliance on oil, reducing air pollution and emissions and increasing the demand for biodiesel in the region whil helping expand the supply of the alternative fuel. TriMet plans to test the biodiesel in 75 of their LIFT buses until spring 2006. According to the press release, if all goes well, TriMet plans to have all 210 of the LIFT buses using B5 biodiesel within the year. The entire LIFT fleet would consume about 70,000 gallons of biodiesel per month. The agency will also evaluate the potential of using biodiesel in the their 611 fixed-route buses in the future. Personally, I'm not sure what they are looking to 'test'. It seems like biodiesel has a pretty strong track record at this point in a number of applications across the world. I would imagine TriMet is more concerned about potential logistics and supply issues with Carson Oil than with performance or maintanence issues from the use of the B5 blend. TriMet is the largest transit district and the largest diesel user in the state of Oregon. You may also remeber that TriMet also got some press here at WattHead last week for partnering with Google on the beta release of their new Transit Trip Planner. While this is largely a symbolic gesture at this point - I'm sure the use of ~27,000 gallons of B5 per month is a drop in the bucket compared to the transit district's overall fuel consumption (and remember its only B5 so only 5% of each gallon is actually biodiesel) - but it is, nonetheless, a first step in the right direction and the folk's at TriMet deserve props for that. TriMet is also in the process of testing hybrid diesel-electric buses. According to the transit district's environmental practices website, Hybrid bus manufacturer, New Flyer of America, along with its hybrid propulsion system suppliers Allison Drives, Inc., and Cummins Corp., have partnered with TriMet to test and evaluate an unspecified number of hybrid buses over the next two years. The buses have a 'series hybrid' drivetrain in which a diesel engine runs a generator which charges a battery pack on the roof. The batteries then power an electric motor that drives the wheels. Regenerative braking, particularly effective in the stop-and-go driving cycle of a transit bus, provides additional charge for the batteries. As I've discussed in previous posts, this series-hybrid setup which allows the bus to be run on an electric motor and transmission rather than an internal combustion engine is quite a bit more efficient. Using the diesel engine as a generator also allows it to be optimized to run at only one speed for maximum efficiency. According to TriMet, the diesel engines used in the hybrid buses are quite a bit smaller than those used in their conventional buses, about the size of a pick-up truck's engine. The reduced engine size and the use of regenerative braking and the more efficient electric drive means TriMet expects a reduction of 75% in emissions compared to their conventional buses. They also expect fuel economy improvements of up to 50%. This should save TriMet considerably as the transit district reports that their regular diesel buses cost about $10,000 to fuel throughout the year. The savings will more than offset the extra costs of the hybrid buses. TriMet also expects the buses to be much quieter as its smaller diesel engine emits less engine noise. Also, the hybrid bus uses its electric drive to accelerates and go up hills without revving the engine. Decreased wear on the suspension. According to TriMet, if these initial tests are succesful (and I don't see why they wouldn't be), the transit disctric plans to buy more hybrids to replace its regular diesel buses as they are retired. The eventually phasing in of hybrid buses like these to replace their conventional diesel fleet would have a substantial impact on fuel use, emissions and noise from TriMet's large fleet. I can't wait to see more of these on the roads in the Portland Metro and across the country. One final plug for TriMet's enviro-conscious efforts: apparently the transit district is installing solar panels to power the lights on 40 of the bus shelters on their Number 57 line. The 'TV Highway' line happens to be the only line that makes it all the way out to my hometown of Forest Grove at the far west end of the metro area. The panels should be installed by the end of this month. According to TriMet, each unit consists of a roof-mounted PV cell that charges a battery which in turn powers an efficient light-emitting diode (LED) that lights the shelter at night. A motion detector conserves power by boosting the light's brightness in five-minute increments when people are in or near the shelter. Although the solar lighting costs extra, TriMet claims that it saves the cost of power-conduit installation and ongoing monthly power bills. Well, I've seen designs for flying wind turbines before (check out Sky WindPower's design, for example) but a new design from Magenn Power Inc might be a bit more practical and has been generating some excitement from readers over at Treehugger. Unlike Sky WindPower's gyrocopter-based design, Magenn's design seems much simpler, is designed to operate at lower alititudes, and is based on well-developed airship technology. The Magenn Power Air Rotor System (MARS), is an innovative lighter-than-air tethered device that rotates about a horizontal axis in response to wind. A helium (or hydrogen) filled airship-like bouyant turbine, the 'Air Rotor', is tethered to the ground by an insulated conductive tether and rises to a height of 400 to 1000 feet to take advantage of more constant and higher wind speeds at higher altitudes. There, the body of the Air Rotor spins in the wind generating electricity which is transferred down the tether to a transformer at a ground station and then transferred to the electricity power grid. The body of the Air Rotor is constructed of Vectran, a high tenacity, bulletproof, composite woven material (similar to Kevlar) that is stronger than steel of the same thickness. The MARS turbine gets both bouyancy from it's lighter-than-air contents as well lift from the 'Magnus effect.' Named for the Magnus airship designed by MARS designer, Fred Ferguson, the Magnus effect refers to the behavior of a rotating airship wherein as wind speed increases, the rotation of the airship increases, which in turn generates lift, increases stability and minimizes air drag because of reduced leaning. It also keeps the MARS turbine positioned within a very controlled and restricted location, and causes it to pull up overhead rather than drift downwind on its tether. Magenn Air Rotor System is less expensive per unit of actual electrical energy output than competing wind power systems. Magenn Power Air Rotor System will deliver time-averaged output much closer to its rated capacity than the capacity factor typical with conventional designs. Magenn efficiency will be 40 to 50 percent [normal industrial-scale turbines have capacity factors more like 20-30% for comparison). This is hugely important, since doubling capacity factor cuts the cost of each delivered watt by half. Wind farms can be placed closer to demand centers, reducing transmission line costs and transmission line loses. Conventional wind generators are only operable in wind speeds between 3 meters/sec and 28 meters/sec. Magenn Air Rotors are operable between 1 meter/sec and in excess of 28 meters/sec. Magenn Air Rotors can be raised to higher altitudes, thus capitalizing on higher winds aloft. Altitudes from 400-ft to 1,000-ft above ground level are possible, without having to build an expensive tower, or use a crane to perform maintenance. Magenn Air Rotors are mobile and can be easily moved to different locations to correspond to changing wind patterns. Mobility is also useful in emergency deployment and disaster relief situations. Magenn claims that these qualities combine to make their MARS turbines "the most cost-effective wind electrical generation system." "The Magenn system concept is deployment-flexible. Large MARS units may be deployed to supplement established grid systems supporting the electrical requirements of large urban areas. Small MARS units would be deployed in emergency, as-needed, and/or mobile applications (e.g., pack version deployed by a hiker, motorist, boater, or for military and emergency response applications). Various in-between sizes would be ideal for farms, houses and cottages located where grid power is nonexistent. Small to medium sized systems could also be air-dropped into disaster areas for emergency electrical power for medical and all other uses." According to Magenn, the company "will start manufacturing its Air Rotors in Fall of 2006 and will start taking product orders in April of 2006 for ... 4.0 kW MARS units." These "cottage or home sized" units will be 39 feet long with a 14-foot diameter and are designed to operate at a height of 150-400 feet. Target price at release will be $9,999 (USD). According to their products page, Magenn also plans to release both larger and smaller sized units between 2007 and 2009 starting with a camper or boater sized 1 kW unit (6.5' diameter, 19.5' long, operating height of 50-150') that they plan to sell for $1,999 (USD) beginning in 2007. The largest planned turbines would be released in 2009 and include two units suitable for commercial power applications and rated at 800 kW and 1.6 MW. Both units supposedly would have a 67' diameter, be 200' long, and operate at heights of 400-925'. I'm confused about how they could get double the output from the same-sized unit though. The price of these units is still to be determined. MARS units may not operate in controlled airspace or within five miles of the boundary of any airport. MARS units that are deployed over 150 feet on a permanent basis will require a NOTAM, which stands for: Notices to Airmen. A NOTAM is issued by the FAA or its equivalent to inform pilots of new or changed aeronautical facilities, services, procedures, or hazards, temporary or permanent. NOTAMS are not difficult to obtain, but will be necessary in most deployment cases in US, Canada and Europe. MARS units that operate over 150 feet will have a lighting system including individual lights that are placed every 50 feet on its tether. The lights will flash once per second. MARS units will have a Rapid Deflation Device installed that will automatically and rapidly deflate the balloon if it escapes from its moorings. MARS device will be equipped with at least two deflate systems that will bring the units slowly and safely to the ground. If the MARS unit "cut down" system does not function properly, it will immediately notify the nearest ATC facility of the location and time of the escaped and the estimated flight path of the balloon. MARS units balloon envelope is equipped with a radar reflective material that will present an echo to surface radar operating in the 200 MHz to 2700 MHz frequency range." I think the most significant problem that Magenn's flying turbines will have to overcome will be issues with visual pollution. I'm pretty certain that NIMBY (Not In My BackYard) opposition would be substantial to having a few dozen flying turbines tethered above urban areas with blinking lights every 50 feet along each tether. These might meet a more warm reception from farmers or other people living in rural areas where the small population density might make NIMBY opposition smaller. Small MARS turbines may find a niche in disaster relief applications as well where the dire situation would presumably outweigh any NIMBY issues that might arise. In the end though, this is a very smart design and offers some substantial advantages over normal turbines. Being able to deploy the turbines at much higher heights than traditional turbines where they can utilize more constant wind speeds could seriously decrease the levelized cost of wind power. Additionally, being able to delpoy these turbines closer to urban areas - where wind speeds are not high enough at lower elevations to support traditional wind turbines but might be high enough at altitudes of 1,000 ft - would avoid infrastructure issues that plague traditional wind developments. Such traditional developments are often sited in remote locations where the costs of building new infrastructure to connect to the grid can become a substantial portion of overall project costs. Citing generation near demand centers also reduces transmission losses. Also, eliminating the need for the large steel towers that support traditional turbines means that the MARS design could likely deployed at a lower cost than traditional turbines. It will be interesting to see if this design can overcome NIMBY opposition to visual pollution issues. If it can, Magenn's MARS flying turbines could become another useful addition to our renewable energy 'toolbox'. How would you like to power the entire U.S. fleet of cars and light trucks using only half the oil we currently use? What would you say if I told you we could even do it without using a single drop of petroleum?! Here's how this breaks down in terms of oil consumption: according to the TDB (p. 1-18) we currently use about 13.2 million barrels of oil per day (million bbl/d) for transportation. 56.6% of this or 7.4712 million bbl/d go towards running the U.S. fleet of cars and light trucks (TDB p. 2-1). At 5.8 million BTU energy content per bbl of oil, that's 43,332,960 million BTU per day of energy used by our cars and light trucks. At 17.15% overall efficiency, only 7,431,602 million BTU of that energy makes it to the vehicles wheels. So, is there a more efficient way to get the energy from the barrel of oil to the wheels of our cars? Fortunately, yes there is. Electric Vehicles - Who Needs Oil? That's an improvement of 191% or almost double the efficiency of an ICE fuel pathway. Right there, just by burning our petroleum in efficient combined cycle plants, rather than inefficient gasoline and diesel internal combustion engines, to create electricity and run an electric drive-train vehicle, we could cut our oil consumption for cars and light trucks almost in half. We would only need 52.28% of the oil we currently use, for a savings of 3.565 million barrels of oil per day! OK, but I promised you we wouldn't need a drop of oil and so far I've only cut our oil consumption in half. We've still got a long way to go right? Wrong. The beauty of using electricity as your primary fuel is that it is not dependent on petroleum to generate. Unlike gasoline, electricity can be made from a myriad of sources, some renewable and others not, all of them producable from within the United States (unlike oil which requires us to import almost 2/3rd of our oil needs and is never renewable). That means we could potentially eliminate our dependence on oil for our car and light vehicle fleet completely if we were to transition to an all-electric fleet. There we have it, we can power our entire light vehicle fleet with electricity from off-peak power plants, eliminating the need for 7.471 million barrels of oil per day and without constructing a single new power plant. If that isnt impressive, you're not paying attention. OK, so about now is where all those folks who complain about the limited range of electric vehicles start chiming in. What do we do when we want to drive to Grandma's house for Thanksgiving or take the kids on that roadtrip to Disneyland or head down to Mardi Gras for Spring Break? We don't want to have to keep two cars in the garage, one for daily trips and another for those longer road trips where an EV's limited range wouldn't cut it? Well, these are all valid complaints. Although it seems like many people could afford to have two cars (many people already do), most would be reluctant to do so, especially those used to the freedom of a gas-guzzler - you can pull in to a gas station anywhere and in five minutes be back on the road and free to drive another 300 miles. Well here's a compromise: plug-in hybrids. That is, a hybrid electric vehicle that can be plug-in to charge and can run in all electric mode for 20-40 miles (like an EV) but can also use gas or diesel on extended trips (like an traditional ICE). This means there are essentially two fuel pathways for this vehicle. The first is the electricity pathway that would be the same as for an EV. 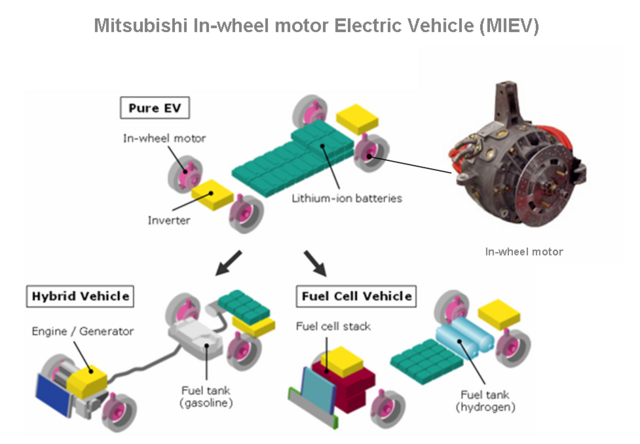 The second would use a gas or diesel generator onboard the car to burn fuel and generate electricity to run the electric drive-train when the batteries are dead [this is called a series-parallel hybrid system and is found in the Mitsubishi Concept-CT MIEV for example]. If we assume an all-electric mode with a 40 mile range, we could probably safely say that at least 2/3rds of our trips could run in all-electric mode. According to the Bureau of Transporation Statistics, the average person in the U.S. drives an average of 40 miles per day so most daily trips could be taken using only the electric charge. As we discovered above, this power could easily be provided by existing idle off-peak generation capacity if the plug-in vehicle was charged overnight. That means that just like the EV discussed above, 2/3rds of the driving done in a plug-in could be done without any oil! Notice this is more efficient than the ICE fuel pathway, which is why we use the diesel gen-set to generate electricity and run the electric drivetrain rather than using it to run an ICE engine and drive-train (the latter is what they do in all hybrids currently on the market - Toyota's 'Synergy drive' for example features a split drivetrain that uses both an electric motor and an ICE engine). What does this mean in terms of oil consumption? Well, we would need to get only 1/3rd of the at-wheels energy from the diesel gen-set or 2,526,745 million BTU. With 25.92% overall efficiency that would mean we would need 9,748,244 million BTU of petroleum (i.e. diesel) fuel or the equivalent of only 1.680 million barrels per day. Thus we would need only 22.5% of the oil we currently consume for our light vehicle fleet for a net savings of 5.79 million barrels of oil per day. This would eliminate 28.38% of total U.S. oil consumption! So there's the compromise: we don't entirely eliminate our need for oil to run our transport fleet, but we do cut it down to less than one quarter of current consumption and eliminate over 28% of our total oil consumption at the same time. Doing so gives us the freedom and range of a traditional ICE engine while using less than a quarter of the oil. Clearly using petroleum in internal combustion engines is not the most efficient way to run our light vehicle fleet. Both electric vehicles and plug-in hybrids offer significantly better options. They also allow us to use electricity, giving us the freedom to power of fleet with a variety of energy sources, not just petroleum. Additionally, the United States currently has the existing generation capacity sitting idle every night to power our entire transport fleet if they were EVs or to fully charge the batteries on all of our plug-in hybrids. Well, I'm excited to say that we've hit two new milestones here at WattHead. First off, yesterday was the first day the site reached 100+ visits! Thanks mostly to the folks over at Treehugger who provided a relatively prominent link to my recent post on Mitsubishi's new MIEV concept car, a lot of new folks found there way to WattHead this week. This also helped the site reach another milestone: we recently passed the 1500 total visits mark since I added a site counter to WattHead in October and are now quickly on our way towards 2000+. I'd like to thank all those who have visited my blog and spent the time reading the news, rants and ideas I have posted. I'd also like to welcome all those new readers who visited this week. Thanks for checking out the site and I really hope you stick around, pop back here and scan the posts every once and a while. If anyone has any comments - what you would like to see more or less of here, what you enjoy, general advice, etc. - I'd appreciate them here. Google has unvieled the beta version of its new Transit Trip Planner online service. Like their popular and easy to use driving directions feature, Google Local, Google's Transit Trip planner makes it easy to get from point A to point B - only this time using mass transit instead of that darn gas-guzzlin' car. Google chose Portland, Oregon as the flagship city for the launch of the Planner. 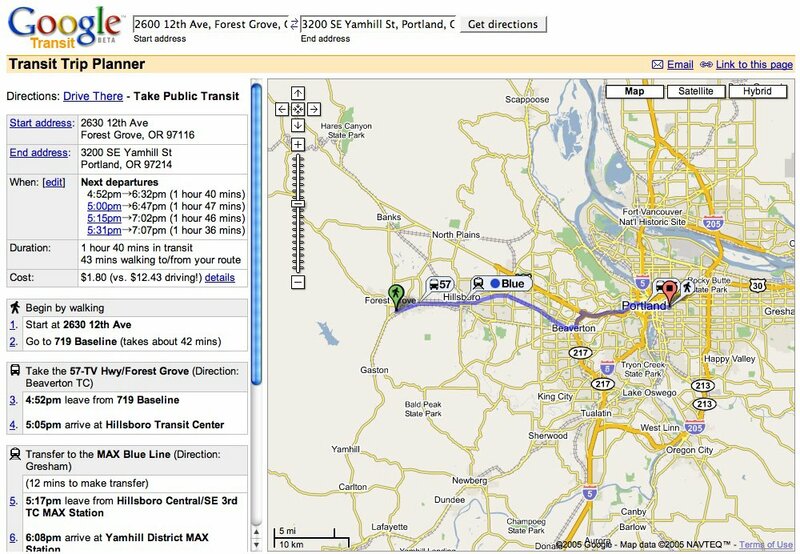 The Planner currently only works for the Portland-metro area under the service of TriMet, the local transit authority. The Planner currently has all the route and schedule data for TriMet's routes. [It seemed to be missing some stops in my hometown of Forest Grove however and told me to walk 45 minutes into neighboring Cornelius to catch the 57 line which stops 6 blocks from my house - there are likely a few kinks to iron out as this is still a beta version]. "We chose to launch with the Portland metro area for a couple of reasons. TriMet, Portland's transit authority, is a technological leader in public transportation. The team at TriMet is a group of tremendously passionate people dedicated to serving their community. And TriMet has a wealth of data readily available that they were eager to share with us for this project. This combination of great people and great data made TriMet the ideal partner." The interface looks and feels just like Googles Local's maps and driving directions. It tells you where to walk to to get on the mass transit lines, what lines to take when, where to transfer, etc. all of which it plots out on the zoomable, scrollable maps you're used to from Local with walking and riding differentiated by flags. It estimates how long the trip should take and even tells you how much the trip will cost and compares it to the cost of driving. It allows you to specify start and finish addresses and even lets you choose a specific departure time, suggesting the best combination of routes to get you where you want to go in the shortest period of time based on the desired start time. As anyone who has tried to use public transit at any point to get around a metropolitan area, one of the hardest parts is the process of learning how the system works--how to get where you want to go, when to buses run, etc. If you are like me, you probably only devote the effort to get to a few, specific locations around town you frequently travel to. Figuring out how to get somewhere new can be a bit of a hassle and this can be a major obstacle for many who want to utilize a public transit system, no matter how extensive and useful the system is. Any transit agency worth its salt usually has some kind of trip-planning tool online already, but they generally suffer from sub-par to absolutely unusable interfaces due to lack of development money/talent/effort. This generally means only the most patient or dedicated use the trip-planners. Even if a good system exists in one city, there is no standard application and each is developed specifically for that city. Thus, newcomers to any city won't know where to find their local trip planning tools or how to use them if they did. Having transit trip-planning data in a readable and presentable form utilizing an easy-to-understand and use interface that can be used universally across the country or world will make a big difference. It looks like that's exactly what Google is trying to do. They will be working to develop a standard format for transit system data and trying to expand their Planner to cover other transit areas beyond Portland. "So not too long ago, a few engineers from San Francisco, New York, and Zurich -- all of whom regularly use public transportation -- decided that being able to plan local trips without having to go to multiple websites, and done in an easy, intuitive way would be a useful product. So they devoted their 20 percent time to building it. As it happens, a lot of people thought this was a great idea, and our small team quickly grew with "twenty-percenters" from across Google." I've got to say, I'm proud that Portland is the first city to be included in this latest of Google's innovations. I'm also excited to see the Transit Trip Planner spread to other cities and hopefully become a universal system accross the country or even the world. It will no doubt have a positive impact on ridership in the cities that it includes. Props to Google and the dedicated employees who devoted their 20% time to working on a very worthwhile project! The all-new redesigned 2007 Toyota Camry and the much anticipated Camry Hybrid will both be unvieled at a press conference at the 2006 American International Auto Show (Detroit Auto Show) in Detroit on January 9th, according to a Toyota press release issued today. The hybrid version of the Camry will feature Toyota's Hybrid Synergy Drive and will be Toyota's first application of the system to a vehicle that also has a non-hybrid version. The Camry has been the best-selling car in America for seven of the past eight years and the hybrid version will likely be popular. "The completely restyled and reengineered Camry will feature significantly improved performance and new level of comfort and refinement. Toyota extends its hybrid leadership by making its exclusive Hybrid Synergy Drive available in the 2007 Camry. The Camry Hybrid will deliver the highest level of Camry performance ever achieved in both fuel efficiency and low emissions and also achieve impressive power." According to a Toyota press release, the new Camry line consists of a price-leader CE trim level, volume LE, sporty SE, and luxury XLE [I believe this is for the non-hybrids, hybrids will likely come in only one trim initially, similar to the Civic or Accord hybrids from Honda]. All non-hybrid Camrys will feature a 2.4 liters 4-cylinder engine of 167 hp. The LE, SE, and XLE trims will also offer V6 versions with a 268-hp 3.5-liter and a 6-speed automatic transmission. 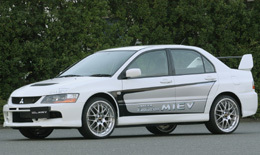 This is more horespower than Camry's previous most-powerful V6 which had 210 hp and used a 5-speed automatic. The 4-cylinder hybrid and non-hybrid models will come with either a 5-speed manual transmission or a 5-speed automtic. Both '07 automatics include a manual shift gate. The hybrid version of the Camry teams a special 2.4-liter 4-cylinder gas engine with a battery-powered electric motor for 192 net hp. It features a continuously variable automatic transmission (CVT) which provides near-infinite drive ratios and keeps the torque at optimum levels, boosting acceleration time, responsiveness and gas mileage (usually by ~10%). There was initial speculation that the hybrid Camry would not follow the lead of Honda's Accord Hybrid that features a V6 engine and uses the hybrid drive to add even more horsepower (a beafy 255 hp) than the non-hybrid. It seems however, that the Camry Hybrid will offer more hp than the baseline 4-cylinder regular model (192 hp vs. 167). However, the hybrid model will still likely see much better gas mileage than the regular Camry (the addition of CVT alone probably compensates for the loss if mileage from the extra horsepower). It will also likely be much more fun to drive - a bit more hp with the addition of CVT should offer a responsive, quick ride. Both models have newly-redesigned exteriors that offer a sleak drag coefficient of 0.28 (the Prius, at 0.26, is one of the most "slippery" cars on the road) which should help them achieve good highway fuel economy. The translated article also reports that the length of both models will be the same as the 2002-2006 Camry but will add 2.2 inches to wheelbase and cut the height by nearly an inch. Base-model curb weight is up some 175 lb from the previous Camry models. An ABC news story from May of this year (when Toyota first announced they would build the hybrid Camry) reported that Toyota plants to build 48,000 Camry hybrids each year at their largest North American production plant in Georgetown, Kentucky. This will mark Toyota's first hybrid auto production in North America. Toyota does not plan to add any additional plants or additions and hybrid production will take place on the Georgetown plant's existing lines. The 7.5 million square foot plant currently produces the Camry, Avalon and Solara models. The innovative automotive company ZAP featured two Brazilian-made Obvio mini-car models among the fleet of innovative and efficient vehicles they showcased at the San Francisco International Auto Show this week. The Obvio 828 and the sportier Obvio 012 (pictured here) feature three seats (side by side) and are both powered by a Tritec 1.6 litre four cylinder motor (the same used in the MINI) that is flexible fuel capable, enabling the cars to run on any blend of ethanol and gasoline (probably up to E85). GizMag also reports that the two models also feature an additional electric drive. This would effectively make these the world’s first “trybrid” automobiles, or flex-fuel hybrids, that can utilize three energy sources: biofuels, electricity and traditional gasoline. The Obvio models allows you to control the transmission with two driving modes – a stepless automatic or six-speed electronic "manual" with paddle shift levers on the steering wheel. This paddle set-up is used in Formula One race cars, and make it easier to change gear on bends and in tricky situations, without having to adjust the revs or taking your hands off the wheel. The engines are available in either a 150 horsepower (hp) 'low consumption' option or a beefy 250 hp 'high power' option. The 150 hp version gets 29.4 MPG (2.5 Km/Liter) city and 40.69 MPG (17,3 Km/Liter on the highway according to Obvio (no fuel economy stats on the 250 hp version). ZAP announced this October that it had negotiated to become the liscenced North American distributer of both Obvio models. GreenCarCongress reports that unlike ZAP's approach to selling the Americanized version of the SMART car where they take responsibility for converting imported smarts to meet US requirements, ZAP has taken a 20% stake in Obvio and will work closely with the Brazilian company to ensure the vehicles are fully ready for sale in the U.S. when they leave the plant. According to Obvio, the target price for the 828 will be $14,000 (USD) and the sportier 012 will ring in at the heaftier price of $28,000. The 828 should be avialable in the U.S. (at least for pre-registration) in the third quarter of 2006 and the 012 will be available fourth quarter '07, accoring to ZAP and Obvio. Well, I'm a bit skeptical of the hybrid claim made by GizMag. If it is true, that would be excellent. Hybrid and flex-fuel have just been asking to be paired for some time now. It is only a matter of time before someone pairs these two 'green' auto technologies in one car. Even without the hybrid drive, these two cars are sure innovative. While the 828 is best classified as 'cute', the 012 is pretty sporty and both look very fun to drive: zippy and responsive (thanks to that CVT). The engines in these cars are quite big for their size (even the 150 hp version) and Obvio clearly opted for a trade-off between fuel efficiency and performance. The 29/40 MPG fuel economy isn't particularly impressive (especially when compared to other mini-cars like the SMART) and it could have been significanlty improved, I'm sure, if they had downsized the engine a bit. As the Oregonian reports this week, Oregon Governor Ted Kulongoski has ordered the state Department of Environmental Quality (DEQ) to write a California-type emissions standard that would apply to 2009 model year cars and light trucks. Vehicles made and sold before the 2009 model year would not be affected. Kulongoski has made it a priority for Oregon to adopt the stricter tailpipe emissions standards and has previously vowed that he would bypass the state legislature, who have opposed such a standard, if necessary. This move seems to indicate that he is still resolved to enact the new standards executively. "All of us -- individuals and institutions -- have played a role in contributing to the effects of global warming, and we each have a responsibility to curb those effects for future generations," Kulongoski said in a letter to Department of Environmental Quality Director Stephanie Hallock. The Oregonian reports that the proposed rule to be drafted by DEQ must still be approved by the state's Environmental Quality Commission. However, this is a policy panel appointed by the governor and is not expected to be a roadblock. A Kulongoski spokeswoman, Anna Richter Taylor, said the governor wants a temporary emissions rule by the end of the year. The commission would then begin a process, including public hearings, to convert the temporary rule into permanent emissions standards. A potential roadblock does looms however in Marion County Circuit Court. Republican lawmakers and auto industry representatives have filed a lawsuit there claiming that neither the governor nor the DEQ has the authority to adopt California's tailpipe rules when the Legislature has voted to forbid it - the legislature recently included an item in the budget Marion County Circuit Judge Mary Mertens James has promised a "timely" decision in the case. The Legislature had previously included a prohibition against adopting the California standards in Oregon's 2005-07 budget, but Governor Kulongoski vetoed that section of the bill. The issue in the court case is whether the governor's line item veto authority, which allows him to strike specific spending items from budget bills, also extends to policy in the bills. Public support seems to be behind the bill despite opposition from the Legislature and thousands of Oregonians, including those representing conservation as well as faith groups, have written the governor and DEQ urging Oregon to adopt the California standards, which are tougher than the federal standards [myself being one of them]. Adopting the California standards would not only impose tighter restrictions on already regulated emissions like sulpher-oxides and nitrous-oxide but would also include the new CO2 emissions standards recently implemented by California and subsequently adopted by a number of other states (the latest being New York). Kulongoski's efforts would not only effect Oregon as Washington has already passed legislation adopting the California standards, but only if Oregon does so as well. Oregon thus remains the crucial linch-pin in creating a unified region spanning the west coast of the United States from Canada to Mexico that would have tighter restrictions on criteria pollutants as well as carbon dioxide emissions from vehicle tailpipes. A DEQ analysis found that if Oregon adopted California's standards, it could reduce carbon dioxide emissions from cars and light-duty trucks 18 percent by 2020 and 27 percent by 2030. I personally applaud Kulongoski's bold efforts to adopt these standards (I am a lifetime resident of Oregon, BTW). This would have a serious impact on our state's GHG emissions profile as well as Washington's as their fate seems to be tied in this matter, at least for now, to ours. Let's hope the Marion County Court finds in the governor's favor and no major roadblocks obstruct these standards from being adopted. Opponents of the measure, including Republicans in the State Legislature and auto industry representatives claim that the measures will add $3,000 to the cost of a new car in an attempt to scare consumers and would-be supporters of these standards. That cost has been repeadetly disputed by many including California Air Resources Board, and it must be remebered that any extra costs would almost certainly be recouped in fuel savings due to the increase in vehicle fuel economy that would be necessary to meet CO2 emissions standards. The auto industry is fighting this measure hard, but they now seem to be assailed from all sides. California, Vermont, New York and now Oregon and Washington have adopted the new standards and many others including Massachusetts, Maine, Connecticut, Rhode Island , New Mexico, and Arizona are considering adopting the standards as well. With consistent efforts from a number of states, it seems only a matter of time until the auto industry gives up. Once enough states adopt these standards, there will be little incentive for auto manufacturers to maintain two sets of vehicle models (one for states with CA standards and one for those with federal standards) and will likely cave in and begin manufacturing all their cars to meet the stricter California standards. That seems like good news for everyone to me.